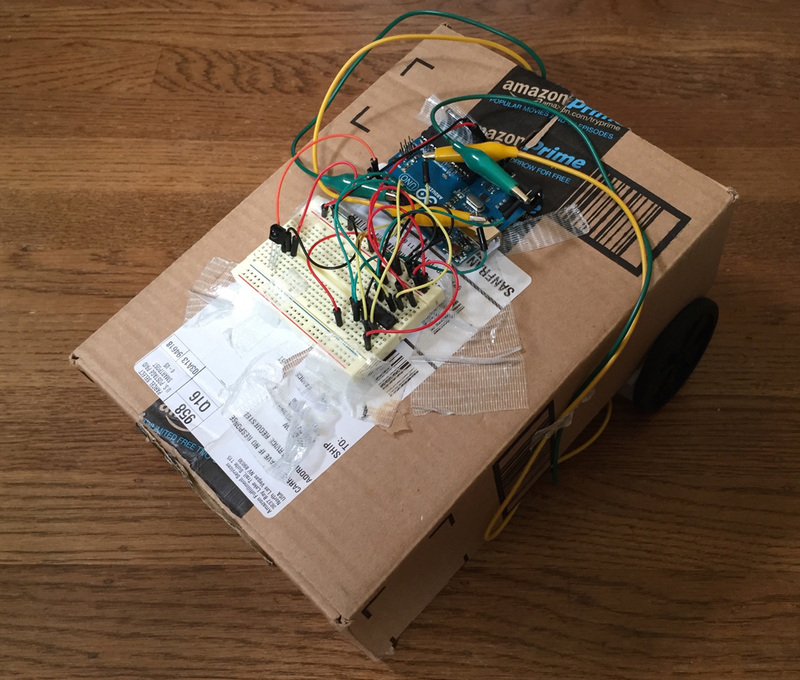 The remote control cardboard box robot uses a standard (“universal”) infrared TV remote and a infrared receiver to control a cardboard box with two motorized wheels. You analyze your remote to see what messages it’s sending, and use your data to choose which buttons cause which actions on the box robot. 2 gearmotors. These are great low-speed motors, but there are many other options! 2 motor wheels. These should fit snugly on the motors. 1 L293D or SN754410 motor driver (for our purposes, these chips are the same – get whichever is less expensive). Use alligator clips to connect the motors, one end clipped to a motor lead, and the other end clipped to a jumper wire. In this sheet, pin V<sub>S</sub> should be connected to 5V, pin GND to ground, and OUT to Arduino digital pin 2. Use the values in your sheet to connect the correct pins! First, test your motor wiring by running the following motor testing code. The wheels should move forward for a second, then stop for a second, and repeat. If either or both wheels are rotating in the wrong direction, switch two connectors around on those wheels. Scaffolding to figure out motor directions. Install the IR Remote library: in Arduino, in the “Sketch” menu, select “Import Library…” then “Manage Libraries…”, and in the resulting window, search for “IRRemote” and install the library by “shirriff”. Set two motor pins based on input from an infrared remote control. // add more control functions here!
} // add more "else if" conditions here for other buttons! Open the Serial Monitor in Arduino – that’s the magnifying glass icon in the upper-right corner of the window. Pick a button that you want to trigger your box’s forward motion. Press that button and see which number appears in the serial monitor. This is the hexadecimal version of the number the remote sends when you press the button. Copy this number. Upload your code and make sure the forward button on your remote makes your box move forward. If it doesn’t – what went wrong? If nothing happens at all, check to make sure you are still seeing the same number in the serial monitor. If the box moves, but not in the direction you expect, check the forward & reverse pins for each motor. Repeat steps 4-6 for the halt function, picking a new button, copying it into the "HALT" if statement in the code, and testing. To fully control your box, you’ll want extra control functions: at least reverse, left, and right. Each should be triggered by a specific button on your remote. Add additional else if statements for reverse, left, and right. These will look very similar to the else if statement for the halt function, except you’ll compare results.value to a different button number, call the reverse(), left(), or right() function instead of halt(), and print a different string.